This is the 4th in a series of posts on the national electrical grid. In previous posts I have described the components of The Grid, the National Electric Reliability Corporation’s (NERC) role in regulating The Grid, and the general flow of electricity in The Grid. This post focuses on Missouri’s position on The Grid. Figure 1. Source: North American Reliability Corporation 2017. NERC organizes its reliability report according to assessment regions. Missouri is divided among 3 assessment regions (Figure 1). Shown in dark blue, portions of western Missouri fall into the SPP Region (Southwest Power Pool). Shown in gray, Central Missouri, running from Arkansas to Iowa, falls into SERC-North (Southeast Electric Reliability Corporation-North). Shown in dark blue, part of Eastern Missouri falls into the MISO (Midwest Independent Service Organization). Figure 2. Data source: U.S. Energy Information Administration 2018a. In 2016 Missouri was a net electricity importer. A total of 5,252,645 MWh (billion watt-hours) were imported from other states, and none were exported. 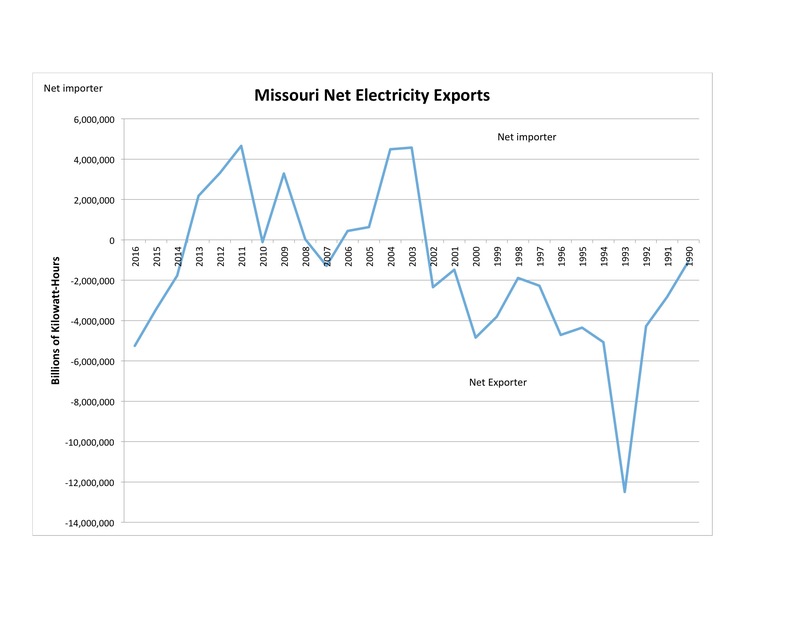 Figure 2 shows that in the 1990s, Missouri was a large energy importer, then it became an exporter in 2003, but then reverted to being an importer in 2014. Missouri’s largest generating plants (by the amount of electricity generated) are shown in Table 1. Combined, they account for about 84% of Missouri’s net generation. For a photo and brief description of many of these power plants, see here. Figure 3. The High Voltage Generation and Distribution System in Missouri. Source: U.S. Energy Information Administration 2018b. Figure 3 shows The Grid within Missouri. In purple-gray it shows lines operating at 765 kilovolts all the way down to 69 kilovolts (more lines are shown in this map than in the map in the previous post because 69 kV is a lower cutoff than was used for that map). The brown lines are roads. It also shows Missouri’s generating stations by type. 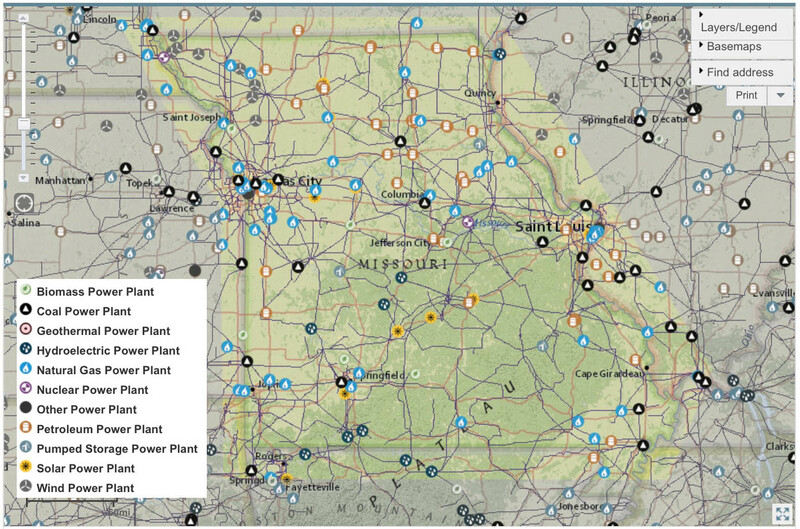 There are actually a fair number of natural gas generating stations, shown in blue with a white center. However, 8 of the 10 largest power plants are coal. The low voltage distribution networks of the public utilities and electrical cooperatives throughout the state are, of course, extensive. Ameren claims to operate 7,500 miles of local transmission line, while Great Plains Energy claims to operate 3,600 miles. These posts focus on the bulk power system, however. Ameren. Ameren Facts and Figures. Viewed online 5/21/2018 at https://www.ameren.com/about/facts. North American Electrical Reliability Corporation. 2017. 2017 Long-Term Reliability Assessment. Downloaded 4/27/2018 from https://www.nerc.com/pa/RAPA/ra/Pages/default.aspx. U.S. Energy Information Administration. 2018a. Missouri Electricity Profile 2016, Full Data Tables 1-14.. Downloaded 5/10/1018 from https://www.eia.gov/electricity/state/missouri. U.S. Energy Information Administration. 2018b. U.S. Energy Mapping System. https://www.eia.gov/state/maps.php. Westar Energy & Great Plains Energy. Merger to Form Leading Company: January 2018 Investor Update. Viewed 5/21/2018 at http://www.greatplainsenergy.com/static-files/b8b91848-48a6-4f88-8fd3-df3b59316b96. By mogreenstats in Energy on 2018/05/31 . Can you comment on the interconnect grid map link attached above? What is the grey shaded region in MO, AR, OK and IA? Does that mean that area is serviced by multiple regional reliability councils (RRC)? Or is that an area in a state of change from one RRC to another, as you mentioned at the beginning of this post? you will find a list of maps published by NERC. The map you reference is the color map of the three large Interconnections. But below it is a map of the NERC Regional Entities. These two maps appear to be almost identical, except the map of interconnections shows the Western and Eastern Interconnections. It also has the grey area you mention. The map of the Regional Entities does not have any gray areas. 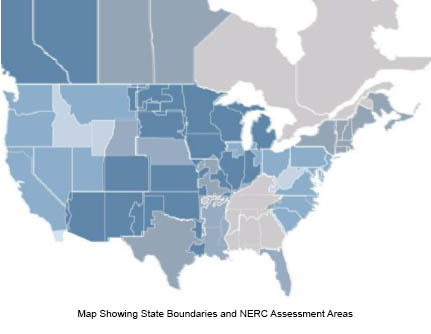 My guess, and it is just a guess, is that the map with the gray areas is an older map, and the gray represents areas that had not yet met NERC standards, and were not allowed into the interconnections. The other map is more recent, and shows that they have now met NERC standards. But it is just a guess. Thank you for your quick response. I poked around a little more, and found this map: http://www.eia.gov/state/maps.cfm. It’s the interactive U.S. Energy mapping system, so I would expect that it would be the most up-to-date available. (It looks like you referenced it in your post already.) If you follow the link, then Layers/Legend > Remove All > then scroll down and select Administrative Boundaries > NERC Regions, the resulting map has everything shaded in EXCEPT the grey area on the previous map in question. That, to me, would lend significant credence to your hypothesis that the unshaded area is not on any interconnect yet.